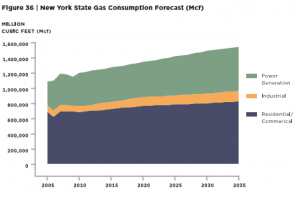 The graph shows New York’s forecast for natural gas use for the next 20 years, increasing year over year. In fact, according to the energy plan, the demand for natural gas in electricity generation is expected to grow from 7.5 trillion cubic feet (Tcf), a 24 percent share in 2011, to nine Tcf (27 percent share) in 2035. Given all the benefits we’ve seen from shale development and increased use of natural gas, both economic and environmental, one would think environmentalists would be happy about the readily available natural gas being produced by their neighbors to the south in Pennsylvania. Instead, the energy plan was criticized by activists for its reliance on natural gas, which they claim will lead to an increase in greenhouse gas emissions.